Ernest Mellquist had only been on the job as a fireman for two weeks when a fire erupted at Rockford Paper Box Board Company on March 8, 1909. Later, people would call it destiny or fate. Personally, Ernest didn’t care what anyone called it, he was just grateful to be alive. Ernest’s sister was in the crowd that Sunday. She was one of a thousand people that came to watch the fire men work on the burning building. She was the first person Ernest saw after the dust settled and only then did he realized how close to death he had actually come. As they embraced Ernest pleaded, “Don’t tell mother how close that was.” That was a promise his sister would not keep. As it turned out, it didn’t matter if Ernest’s sister kept her promise. There was no concealing the news of the terrible fire or the devastating consequences. The word spread throughout the city almost as fast as the fire had consumed the building. Two men had died in the past during fires in the city. Ralph Emerson Junior, was killed assisting the firemen on the Union Furniture Factory In 1893 and a watchman named Upson perished in the fire of the Central Furniture Company. But 1909 was the first time that an official Rockford firefighter was killed in the line of duty. Ernest Pearson was Mellquist’s partner for that March day in 1909. It was actually his day off but Pearson was the captain of Company Number Five and he took his role very seriously. No one even knew how the fire started. The guard for the company was walking through the building around 3:00 p.m. and noticed smoke coming from the area where the baled paper and boxes were stored. The first fire units rolled up to the building within five minutes of the call. The firefighters were stunned to see the building engulfed in flames when they arrived. Giant columns of black smoke billowed from the windows of the building. It was the smoke that drew the huge numbers of people to the scene. Chief Thomas was supervising the men that day and Pearson reported to him when he arrived. Thomas told Pearson to grab Mellquist and get the hose spraying on the south side of the building. Other companies were already working and Chief Thomas felt hopeful that with Pearson and Mellquist on the south side, there might be a chance that at least a portion of the building could be saved. Chief Thomas joined Ray Wantz who was the superintendent of the building to check on the men’s progress. As they reached the south side of the building, Chief Thomas noticed Pearson and Mellquist on a pile of rubble by the building. Pearson had the hose on the building and Mellquist was assisting him. The Chief realized the men were very close to the wall of the building and he yelled a warning to the men to back up a little. But his warning came to late. The crowd of people watching could see what Pearson and Mellquist could not. The intense heat from the fire was causing the brick wall to buckle. In a horrible twist of fate, Pearson’s wife, Irene, was part of the crowd that day. She also saw the wall buckle and recognized the danger. In an unbelievable act of courage, she pushed through the massive crowd at the same time that the others started to back up in fear. Irene knew she would not make it in time when she heard the shriek of the wall as it began to fall. Later, the Chief and Ray Wantz would testify at the inquest that when they heard that roar they both looked to see Captain Pearson and Mellquist still on top of the rubble. Time seemed to slow and they saw both men began to move. Pearson still held the hose and as he moved they were horrified to see the hose catch on some of the debris. As Pearson turned to see what had stopped his movement, his eyes caught the Chief’s. Chief Thomas knew what was going to happen and he closed his eyes as the wall fell. The wail of the falling bricks was replaced with a horrified roar from the crowd. At first, it was thought both Pearson and Mellquist had been caught by the wall. Men surged forward to begin the task of rescuing their fellow firefighters. It took less than five minutes to get the bricks removed. During that time, the crowd had parted enough so that Irene could reach her husband’s side. The firefighters gently lifted Pearson’s broken body onto a stretcher and covered the worst of the damage from the eyes of his wife. Irene accompanied the body of her husband to the hospital where he was pronounced dead. Every bone in Pearson’s body had been broken in the accident. Pearson’s wife and young son were accompanied by his fellow firefighters and police officers in the funeral procession to Scandinavian Cemetery where he was laid to rest. 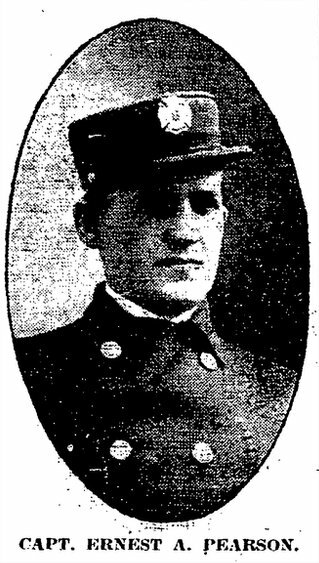 Ernest Mellquist served our city as a firefighter until 1930.